Buy Clearspring Organic Japanese Tofu (long life) - 300g in the UK from our online shop or directly from our independent Scottish store. This organic Japanese tofu is silken and smooth. It's got a long shelf life and doesn't need to be kept in the fridge before opening. Silken tofu is produced by coagulating soya milk without curdling it and is normally available in two consistencies: soft and firm. Who says you can’t have chocolate puddings without dairy?! I thought it would be hard to get a soft consistency, but the whipped Soyatoo cream worked really well and in a blind taste test, dairy eaters, wouldn't realize this chocolate pudding is actually vegan! This recipe contains 400g Clearspring Silken Tofu. This delicious Japanese salad makes a nice change to the usual lettuce salad and the dressing is something special! This recipe contains 1 pack of Clearspring Ambient Tofu. This Pad Thai recipe is absolutely delicious. This recipe contains 150g Clearspring Silken Tofu. Quick to prepare and very refreshing, the tofu in this recipe will help to keep you cool on a sunny day. This recipe contains 300g Clearspring Tofu. A hearty breakfast ideal for cold winter months, courtesy of Clearspring This recipe contains 800g Clearspring Silken Tofu. As official Clearspring stockist, we sell genuine Meat Substitutes directly from our shop in Scotland and online throughout the UK. Where can you buy real Organic Tofu safely online? 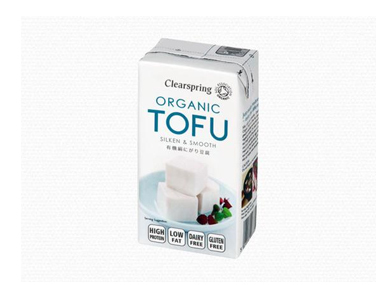 If you are wondering where you can buy Clearspring Organic Japanese Tofu (long life) - 300g safely online in the UK, then shop with us. We are an actual health foods shop; with real people selling real foods and products. Our award-winning independent shop is located in Stirling, Scotland since 1976. You can buy our Organic food and other genuine Meat Substitutes in store or safely place an order with us online or over the phone. Organic Tofu - Clearspring Organic Japanese Tofu (long life) - 300g in Meat Substitutes and Foods.